We received a tremendous response to this month's blog giveaway! Thank you to everyone who left their comments on our last blog post; we thoroughly enjoyed reading each one. Congratulations to Julie, who was selected via Random.org as this month's prize winner (we will contact you to arrange for the delivery of your Karbonz DPNs). Julie said, "I would love to try out the size 2s and 3s DPN. 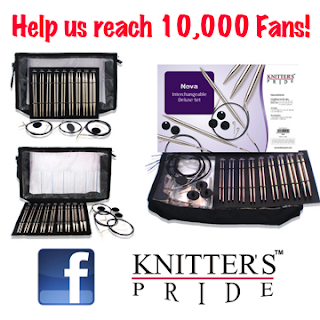 Pretty much all my sock needles are bent, would love to use something that wouldn't do that.."
We have another chance for you to win a prize from Knitter's Pride - as soon as we reach 10,000 Fans on Facebook, we'll be giving away a Deluxe Nova Interchangeable Set! Click here to view all the details on Facebook, and don't forget to like our page and recommend it to your friends so that we reach our goal faster! Finally, we'd like to share the latest Knitter's Pride in Action photos that have been submitted by our wonderful and creative fans. Click here to view & submit photos in our dedicated Ravelry thread; you can also submit via Twitter and Facebook or view our Facebook album here! L-R: Dreamz Interchangeables (submitted by MrsMommy), Dreamz DPNs (submitted by Kmfox), Karbonz Needles (submitted by @YarnYenta). As seen on Knitter's Review: Karbonz Needles! There's been a lot of buzz about our Karbonz needles; most recently, Clara Parkes shared her thoughts on these high-tech needles on the Knitter's Review website. We're quite flattered with her analysis! If you've been curious about carbon fiber needles, click here to get the scoop from one of our industry's finest experts! Now for the best part: we'd like to give you a chance to try Karbonz out for yourself! Leave a comment on this post sharing why you'd like to knit with these needles for your chance to win a pair of Karbonz DPNs. We'll randomly select one lucky reader to win the prize on Friday, March 22. Be sure to leave your Ravelry ID or e-mail address so that we can contact you if you win!